On the 'Net for their earnings ability. The northeastern US was hit by a freakishly early snowstorm that knocked out electric power to 2.7 million people including Dr. 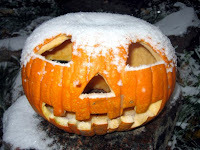 Goose, in whose town Hallowe'en "trick-or-treating" was officially postponed as a result. For those of us who depend on the internet to do our jobs, the loss of power came as a rude push back into the 19th century. Even the bankruptcy of commodity broker MF Global became a side note in the elemental struggle to reconnect. It is hoped that the reader will understand the break in the regular posting of these Limericks Économiques.